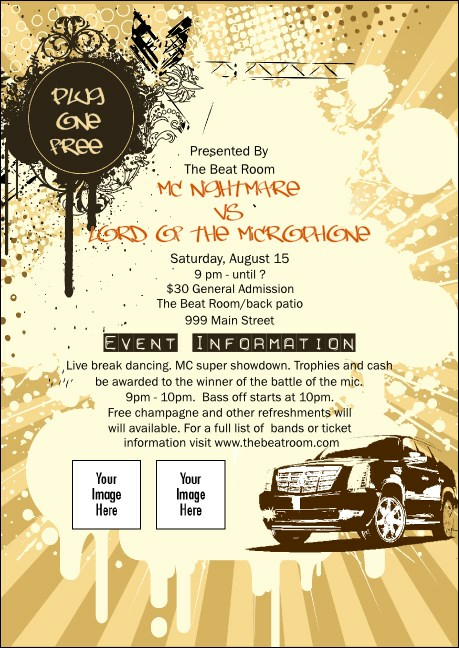 Ready to rock the mic and bring down the house? Kick your big hip hop promotion off with class using Hip Hop Club Flyers. In cream and black with a sweet ride and space to upload two custom images, this Club Flyer lets you add the logos of your sponsors, musical acts, or your own organization. Cruise through TicketPrinting.com's huge online gallery to find designs for every occasion.